Metal frame pools, or commonly called soft side pools, are an alternative to a standard steel wall above ground pool. These pools are very popular and seem to work out well in most cases. I have installed many steel wall pools for people that have owned one of the framed pools in the past. They considered these pools a good learning tool, but were ready for a more permanent type of above ground pool. The problems that I have seen, and heard, about soft sided pools have to do with the fabric discoloring and becoming brittle and with leaks that will not patch. With the proper warranty, these problems should be taken care of by the manufacturer. It is also important to pay close attention to the filter and cleaning equipment that is being offered with the pool. If an upgrade is needed, sometimes it will save you money to do it at the time of purchase. 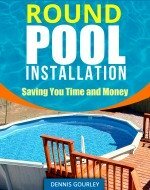 I have installed a lot of these pools and have a few tips to pass on. When the fabric gets hot the metal tubes can be difficult to slide into place. A little baby powder makes this process a lot easier. I level the ground with a laser level and then spread a couple of inches of sand over the entire area. When the sand is smooth, I double check the level again, and adjust as needed. When the pool is up, I level a block under each support leg. With the sand level, and all of the blocks level, the pools seem to look pretty good and stay up without collapsing. 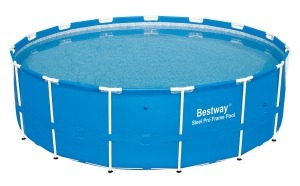 Metal frame pools are available from many different manufactures and come in all different sizes. 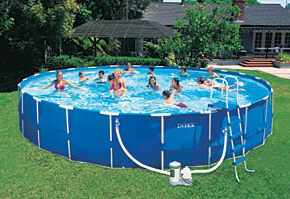 In The Swim carries a few Intex soft sided pools and, as always, with prices that are hard to beat.